Whether you want to start your own garden or want to add a new enclosed place for the most fragile plants – a greenhouse will come like a gem for you. However, they are not the easiest of items to pick or buy, especially when you don’t know much about them. That’s why we decided to bring several options as well as the best greenhouse depending on the users & their needs. If you are searching for one or just want to get the best – this guide will help you enormously. We recommend taking a look further to learn more about these fantastic items and possibly get the best one. Pick the right location for the greenhouse. Make sure it is close to your house or cabin so you can go in and out quickly without feeling annoyed. It is essential to have excellent sunlight exposure, but it’s also important to have the right shade when needed. We recommend picking a location between a tree or wall and an open space. This way you have both shade & sunlight at the same pace. Some bulbs or artificial lights provide a similar effect to sunlight so you can use them along or as an alternative to direct sun exposure for nurturing your plants. But this only works for specific plants, others may not grow without a lot of sun exposure. We recommend having great drainage in the place of installation, this way you prevent flooding which can eventually harm the plants or the greenhouse itself. Direct access to water is essential, while electricity is also useful but not critical. We recommend both for more convenience. You can place several rocks inside the corners of your greenhouse for stability. Barrels or water can also be useful for solar heat. Together they offer great natural benefits to plants while providing stability to the greenhouse. Another critical factor is ventilation. It is advised to have at least two vents in the greenhouse in a place where enough air comes inside. This helps to nurture plants effectively. Finally, make sure to have proper shelves, so the plants grow well without interfering with other. Try pots and trays that separate the seeds from others, so they don’t have problems while increasing. For those looking for a portable greenhouse, the Home-Complete Walk-In will come like a great choice. It is one of the most reliable in the market, offers a very spacious design, and works for practically any application. This greenhouse is also one of the most versatile, easiest to install, and provides little to no issues. The construction of the greenhouse is also of excellent quality and practically leaves nothing to be desired. Especially when it comes to durability & reliability, the Home-Complete Walk-In GreenHouse is an option not to dismiss. Offering the chance to use it indoors and outdoors is an advantage you will enjoy a lot. The real benefit comes when it comes to stability, thanks to a set of zip ties, rope, and anchors for the frame. What’s even better, it offers a PVC cover build & steel frame that provides outstanding durability. Even in the hardest of weathers and conditions, this greenhouse won’t let you down. With the 8-shelves design and the outstandingly easy assembly process, this greenhouse is one of the handiest in the market. Not only it works in almost all weather conditions, but it also makes it easy to be used anywhere you want. 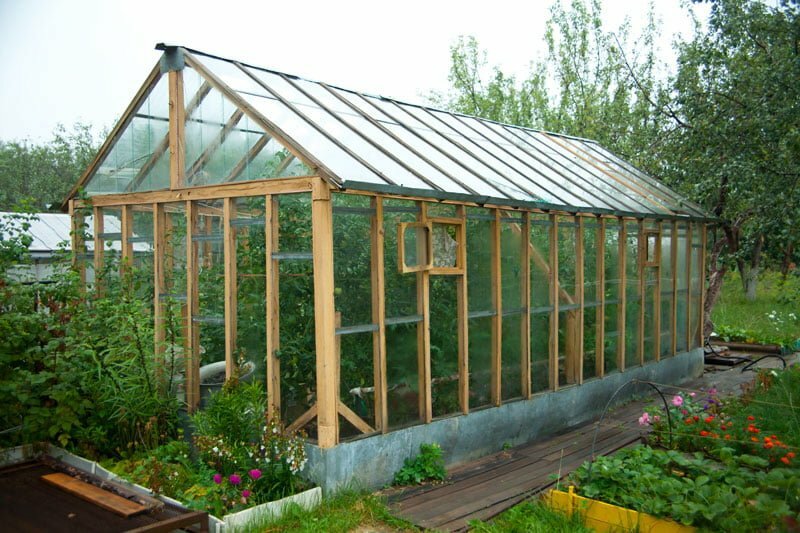 If you wish to install it in your garden or inside your garage, this greenhouse won’t be a problem. Among the best greenhouse kits, the Ohuhu for Outdoors comes like an excellent choice for users who want a more resistant product than most. It is perfectly designed & built with the whole purpose of delivering an outstanding resistance against weather conditions and top-notch durability. It is also beautiful with greenish color and demands little to no effort when it comes to assembly. The overall construction also offers excellent stability, and with its sturdy build, it can hold several pounds of weight without problems. A 12-shelves design made of heavy-duty and rust-resistant steel tubes will never let you down. Not only it means great durability and resistance, but it also means exceptional strength that supports up to 23.4 pounds without issues. It measures 55.5 in length, 56.3 in width and 76.8 inches height. This greenhouse focuses on offering a great experience for years. Superb ease of assembly, completely detachable parts for mobility, and a tool-free installation process – the Ohuhu Greenhouse is a hugely convenient product to have. The real advantage comes when you consider how beautiful it looks, adding a touch of secrecy to your garden. Its design also comes with a zippered door and screened mesh ventilation – so the greenhouse is always aired & fresh. If you are someone who prefers a hobby greenhouse over any other design, the Palram HG5508PH Hybrid greenhouse will come like a gem. It is one of the few that offers everything you need for a greenhouse and more. Here you get a top-notch build for durability & resistance with polycarbonate panels, an aluminum frame, and polypropylene hangers. It also comes with several valuable features such as magnetic door and steel support that keeps the greenhouse hugely stable. Everything you need and more you can have it with this greenhouse. With a 6-feet wide design and 8-feet long, this is easily one of the largest greenhouses available. As a hobby greenhouse, its big design offers great handiness and comfort when inside. Add the magnetic door catch for reliability, a single roof vent for ventilation and air-flow, and rain gutters for irrigation when needed. From temperature to light and even irrigation, this greenhouse offers it all. With a rust-resistant aluminum frame and heavy-duty galvanized steel base, this is a very strong greenhouse. The crystal clear polycarbonate side panels offer excellent light transmission, and with the unbreakable polymer hangers you get a handy build. But the real deal is the twin-wall polycarbonate panels, perfect for heat retention, light diffusion and plant growth without losing durability. Both a small greenhouse and a portable greenhouse in one, the Gardman R687 is a 4-Tier Mini greenhouse for those who prefer or need a lesser option. It works really well on any place, including indoors and outdoors, and offers great results for your plants. Wherever space can be a problem, the Gardman 4-Tier comes like the perfect choice. It is still one of the strongest & most durable, with an excellent design that not only provides superb benefits and features but also manages to be resistant. Made with a polyethylene cover and boasting a push-fit tubular steel frame, you will find this greenhouse very reliable and durable. The whole build manages to offer great waterproof protection and a bug-resistant system. With its portability and excellent roll-up zippered door, you get one of the best builds in the market despite its small design. Superior portability than most in the market with a light and small design, straightforward to assemble with tool-free installation, and very protective of your plants – this greenhouse is not an option to dismiss. Add the removable cover and the easy-access door, and you get one of the best greenhouses without a doubt. Another excellent hobby greenhouse but this time from ShelterLogic, the GrowIT box is an excellent idea for gardeners who want the best result between quality and convenience. The unit comes with 10-feet wide by 20-feet long and 8-feet tall design for a spacious and comfortable operation. It fits hundreds of plants and leaves enough space for two persons to fit inside. The construction is outstanding as well, using a triple-layer cover and a steel frame that leave nothing to be desired. If you want a product that won’t let you down, the Shelter Logic GrowIT box won’t disappoint you. Resistant to peeling, rust, chipping and even corrosion, the DuPont Premium steel frame with powder coating will offer a long-lasting product with excellent reliability. The design is also weatherproof and comes with a UV-treated cover and inside. The RipStop cover is also incredibly resistant, and holds the greenhouse together alongside the ShelterLock 3X steel stabilizers, even in the hardest of climates. The RipStop cover also leaves enough illumination to go in with its translucent cover, and comes with EasyFlow side panels for exceptional ventilation and temperature control. Add the Ratchet Tite easy-to-assemble design with Easy Slide rail system, and you’ll get a greenhouse that focuses on plant care & safety above everything else. Among the best small greenhouse kits, we find the Homewell Mini Walk-In, a perfect choice for those who expect quality over everything else. The 3 tiers and 6 wired shelves allow the user to add as many plants as needed. It works really well for growing and nurturing plants, but the real advantage is the versatility and overall convenience it offers.With its light, small, and convenient design – the Homewell greenhouse is an option you don’t want to dismiss. At 56-inches wide and 29-inches deep with a 77-inches tall design – this exceptional small greenhouse will provide excellent results without problems. Boasting 3 tiers with 6 wired shelves, this greenhouse allows you to add as many plants as you need, with a 75-pound capacity to help them grow and get nurtured without problems. It is the outstanding portability that also makes this product an excellent choice, which alongside its weatherproof build won’t leave anything to be disappointed about. Heavy-duty powder coated steel frame with polyethylene cover and superb ventilation throughout the whole greenhouse – you get everything you could need and more. This is a portable product that still manages to provide the space and overall features to grow plants easily, comfortably, and with outstanding results. You won’t believe how robust & reliable this product is. Despite its large design, this is the best portable greenhouse, directly from a fantastic brand such as Best Choice Products. This tent is designed with the whole purpose of delivering a very spacious and comfy interior without losing strength and portability. The best of all is that it manages to be very useful for growing plants and offering high-quality results. 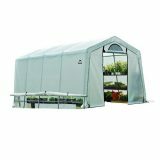 Measuring 15 feet large, 7 feet wide and 7 feet tall – this greenhouse tent is a brilliant choice for those who want great space alongside splendid portability. Boasting high-grade powder-coated steel frame with heavy-duty PE cover, this tent will surely last a lifetime without issues. Add the stakes and the guy ropes for even more strength, and this product won’t fall down even with hard weather conditions. It is also very safe for your plants and offers an effortless set-up & relocation process with its light design. With 8 roll-up windows and a zippered door, you will obtain the ideal access options alongside exceptional ventilation. And when you add the superbly spacious design, you get one of the most convenient greenhouses out there. Let’s not forget it also provides excellent illumination and air-flow, which helps to grow your plants strongly and effectively. This small greenhouse works like a gem for many different purposes. Whether you want the best greenhouse for cold climates, or the most resistant against UV rays, harsh weather conditions, or just whatever – this one won’t let you down. It measures 6-feet long with 4-feet wide and 7-feet tall, perfect for a small garden or patio where you want your plants to grow. From a gardening enthusiast to those who want to start growing small seeds for their farms, the Outsunny will come like the ideal choice easily. UV-Resistant panels made of polycarbonate to protect your plants and nurture them with the right sunlight. Heavy-duty aluminum alloy frame with a powder coating, plus a galvanized base that provides outstanding support & stability. Everything you need for durability & resilience, this greenhouse has it. Adding the transparent polycarbonate sheet for great illumination with the perfectly made rooftop vent that allows more air to go in – you will have the perfect environment for nurturing plants. It also comes with an additional sliding door that provides ideal access. All this alongside an easy-to-assemble design with movable build delivers the ideal convenience for demanding users. A portable hobby greenhouse like the Quictent heavy-duty is another great choice for those who expect the highest quality out there. With its amazing 2-door design and high-quality construction, this greenhouse focuses on providing convenience & great results over time. It comes with several useful quirks such as a transparent cover and ventilation, but it is the addition of several joints & stakes that make this tent so amazing. You won’t find anything to nitpick about with this greenhouse. Boasting a heavy-duty reinforced PE cover with a powder-coated steel framework, you get one of the strongest greenhouses out there. But it is the UV protection and waterproof from the cover and the rust & rot resistance from the framework that makes it so amazing. Add the 2 layers of reinforcement on the polyethylene in the cover and the heavy-duty joints in the frame, and you get the most stable and protection greenhouse in the market. With two zippered doors in the front and back, an excellent ventilation system with 10 vents, and a fully closed buckle system with Velcro and plastic for more convenience. Still, it doesn’t lose any handiness in the process, providing easy access, fantastic ventilation for your plants, and with a transparent cover that allows enough illumination to nurture your seeds. The best small greenhouse without a doubt – the US Garden Supply Premium greenhouse won’t let you down in any way. It is the perfect choice for beginners in this area, those who want to start small and want to grow big with time. Measuring 27-inches long and 19-inches wide with a 63-inches high design – this greenhouse may seem very small, but it is ideal for starting seedlings. Still, it is not the size or the design, but the quality of it that offers a fantastic experience. Despite having a solid steel tubular frame with PVC canopy, it is one of the lightest greenhouses in the market. It will deliver excellent resistant & durability, work really well in outdoor places, and provide outstanding portability. And with its small design, you won’t find any trouble using it at any moment. It demands little assembly time and effort, weights almost nothing for its size and makes mobility pretty easy. This small tent also comes with 4 steel wire tiers or shelves for trays, tools, pots and more – and a roll-up panel with double zippers for effortless access inside. Ideal for almost any environment and location, this tiny greenhouse won’t let you down. After reading our greenhouse reviews, you may be already thinking about which greenhouse to buy. Yet, we believe you should not pick a product until you learn precisely what to look for. Here are four factors we think are essential to learning before buying one of these conservatories. The cover or glazing is the part that goes around the frame. It could be plastic, sheets or glass, solid or fragile, and so on. While all materials are handy for their own advantages, we recommend polycarbonate as the less expensive, illuminated, lightest and still durable material. Otherwise, you can go for glass or hard plastic, if you want more heat retention and excellent protection against weather conditions. However, this is eventually costlier. Another option, you can pick plastic (polyethylene) sheeting covers, which is very useful for illumination and ventilation, comes at a very inexpensive price, but doesn’t last as long as hard plastic or polycarbonate. The right cover will also help with keeping pests out. If you live in an area where insects may infect your seeds or plants, we recommend going for the enclosed & more protection options such as glass or plastic. This part will tell you how stable, reliable, and durable the greenhouse is. Doesn’t matter if it is a small or large conservatory, it is essential to have the ideal framework for superior results. There are several options here, but the most common and the most recommended are powder-coated steel for resistance, reinforced steel for durability, and aluminum for lightness. Here you need to consider several factors at once. But it all comes to the cover and the different features in it. For example, to keep the plants at the right temperature you should have proper insulation. Heating is vital for several seeds and plants, so going for a hard-plastic or glass option is the best choice. But this heat shouldn’t be too much either, so it is ideal to have proper shading and ventilation as well. Those covers that have vents or holes where air can come in are handy. Those that don’t let much illumination in the hottest times of day are also excellent choices. Apart from the frame, cover, and features for temperature control, other accessories such as shelves, doors, windows, and so on can help you to deliver better nurturing for your plants, easier access to the greenhouse, and more. Any additional accessory or tool that comes with the greenhouse will probably be useful in the least expected moment, so going for one with any of these will not be a bad choice. Do They Work In Winter Weather? 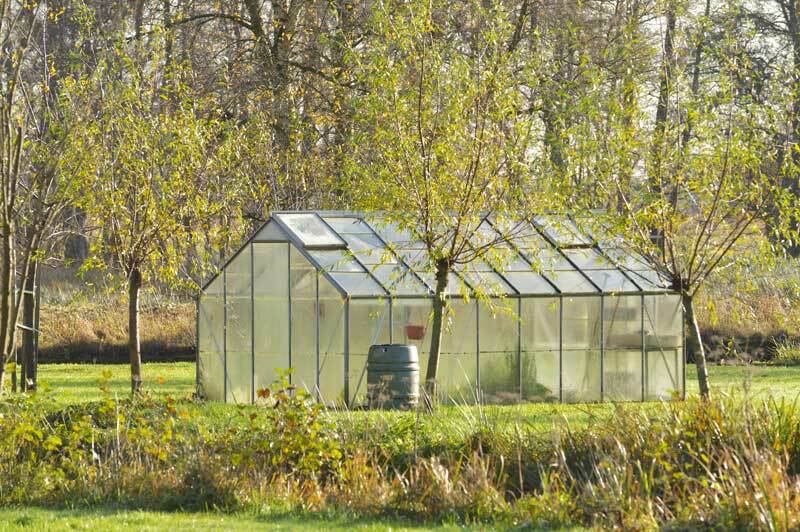 The best greenhouse kits should undoubtedly work even in the harshest of environments. And that means working in winter, spring, fall, summer, and so on. However, winter in the worst places can be pretty bad for plants. That’s why it is essential to have a greenhouse that allows internal electric heater to function correctly as well as enough protection from the snow. If you want a winter greenhouse, it is recommended to go for the hardest and most stable options. But it mostly comes to the additional accessories you use than the design or build of the product. So, yes, most greenhouses will work in winter as long as you have the right setup and machines to make it work. What Kind of Plastic To Use? Large and small greenhouse kits will always come with different types of plastic. No matter the design, you’ll find polyethylene, polycarbonate, copolymer, polyvinyl, and more. We recommend the hardest and most durable such as polycarbonate for those who want resilience and polyethylene for those who prefer ventilation & natural effects. Polyvinyl is pretty similar to polycarbonate, yet it offers more illumination and slightly more ventilation, yet not as much durability. Copolymer, on the other hand, is similar to polyethylene but with a more durable and resilient build. However, copolymer comes in various options, some of them very costly while offering almost the same advantages as polycarbonate. While a small outdoor greenhouse can be useful for someone who has little space in their garden or backyard, a large conservatory will work wonders for someone who has lots of space to use in their house or farm. So, it’s all subjective and according to the needs of the person. However, it also comes down to experience and enthusiasm. We recommend the smallest options for beginners or starters who still don’t know how hard it can be to grow seeds or sprouts. This way, they don’t overdo it and can eventually focus in a few seeds or plants without feeling frustrated if something does not work. In contrast, if you are an experienced person who already knows what to do and not to do when nurturing plants and seeds, then go for a large one. The best greenhouses out there will come with various different cover materials from polycarbonate to polyvinyl and more. But we think PE (polyethylene) mesh is the most recommended of them all, as long as you are planting seeds or sprouts that can benefit from a lot of ventilation and sunlight exposure. This polyethylene mesh is not the most resistant of materials, but it is undoubtedly one of the most useful when it comes to letting your plants receive natural nurturing factors. With its ventilation, sunlight exposure, and lightness, taking care of your plants will be a piece of cake. But of course, this also means harsh weather conditions may eventually harm the cover. After reading our greenhouse kit reviews and going over our buying guides & advice – you may be wondering which option to go for. Well, we think it’s all about going for the product that best fits your overall needs & requirements. No point on going for a large greenhouse when you have little space or going for a portable option when you want a stable and resilience conservatory. So before buying any of these greenhouses, we recommend doing a re-read on each product in the list going over our guides and tips, and make sure to understand completely what having a greenhouse means. Eventually, you’ll pick the ideal option.